Shown above is the Murphy A74. 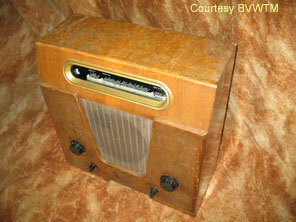 This receiver was positioned in the 1939 range as the special reproduction model. 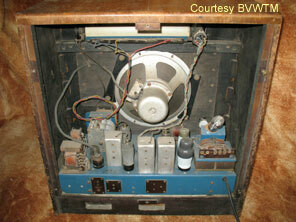 The cabinet is indeed very large, and a 10” loudspeaker is provided. Drum tuning is again included, but to my mind the cabinet is not as impressive as the A50 special reproduction receiver from a year earlier. The output valve has moved on from the AC4/PEN seen in the A50 to the PEN45 which had recently been released by Mazda. This was a very good valve, though of slightly lower output power than the AC4/PEN. Again the receiver was available with the optional pushbutton unit or remote control, though neither are fitted in this example. Valve line-up is TH41, VP41, VP41, HL42DD, ME41, PEN45, UU6.